Kirkcudbright High Street @ High.St - High Street shops and High St businesses. Large Google map of Kirkcudbright High St. 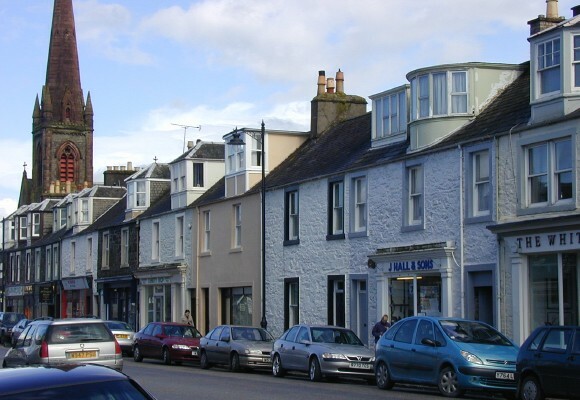 The Old High Street in Kirkcudbright is mainly private houses these days with a few galleries and craft shops that we have listed here. Most of the shops are now on St. Mary's Street and St. Cuthbert Street and we have listed those too. The Old High St is still a draw for visitors, especially artists that come to paint its unspoilt charm. It is not surprising therefore that Kinkcudbright is known as the "Artists's Town". Kirkcudbright's own site has more information about local activities and events in and around the town. The official Dumfries and Galloway Tourist Information website has lots of information about events in the area or you can find out more about the local towns of Wigtown, Newton Stewart and Dalbeattie on this site. We particular recommend a visit to the Gem Rock Museum at Creetown.